We're seeing some delightful hummingbird activity in the garden. They start as early as 5:45AM. I usually slip downstairs to open some windows for extra early morning cool air. Two windows have 'Dropmore Scarlet' honeysuckle growing alongside, and one has Crocosmia 'Lucifer" and the other, a red sage hybrid underneath. Two hummers are regular visitors. They usually come together. When windows are open you can hear theim chittering and their whirring wings. They come right up to the screen and hover in midair to stare at you. When I'm outside, they sometimes hover around -- I might be blocking their way, or my presence was unexpected. A few times, a third hummer would come winging in. One day, there were two of them involved in mid-air wing-bashing. I could hear the wings strike each other. They were so intent that they flew right above my head -- I could've reached out and touched them. I watched as they spiraled up maybe 10~15 feet above me, then a third bird came winging in chittering, and they broke up and flew off. Today, I watched as one flew over my head and landed on a bamboo horizontal of a pea/bean trellis maybe 4 feet away. I could see her flicking her tongue out several times. Then the 2nd one came and tried to land on a trellis netting hanging below. But every time she tried to land, the string would swing and she had to flap to maintain her balance. After trying 4 times, she gave up and hovered up to the bamboo to perch about a foot away from the other one. I mentioned elsewhere that the hummers are sipping from the tomato flowers as well as pole bean flowers. It's kinda neat to think we're eating veggies pollinated by hummingbirds. I couldn't agree more. 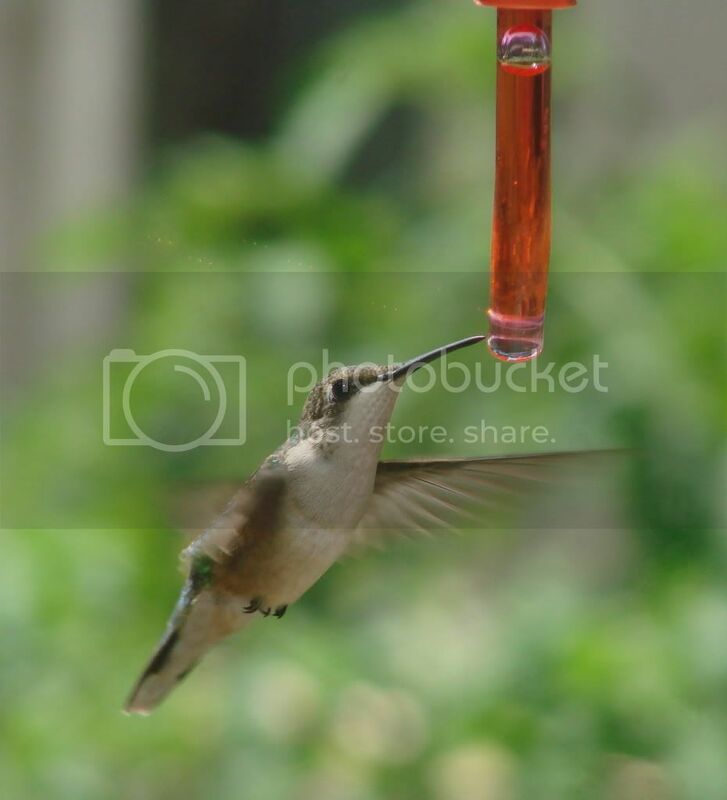 I love hummingbirds so I always have a feeder out (now that my doves are gone ). Their squeaks and click sounds they make is so unique. When I point it out, most people didn't realize that noise was coming from a hummingbird. I'm with you guys on the hummers! I have feeders all over the yard and the little guys actually come and hover around impatiently when I'm filling the feeders. It is so cool. I love hummingbirds, too, but until this year we could never attract any. The phlox are so lush this year, that we decided to put our feeder nearby, and sure enough, we have gotten quite a bit of action. I notice, too, applestar, that they go for the tomato flowers. Do we have the ability to post photos on this forum? I would like to share shots of my hummingbirds and have some help identifying them. I have only seen one with a green (not very brilliant green, but definitely green) back, and my husband says he says seen one that is more brown. I assume the more brilliant coloring is the male, but I thought it would be a more vivid green. +1 on the hummers, we feed them on our deck and there are a number of different kinds that come by every day. If the feeder gets low some times they will buzz the window to let us know, they watch as we put it up then come in for a drink. Some times if my wife has a red a=or a flowered shirt on they buzz her trying to get the flowers. I love how colorful they are. I see we can post pix, but am too computer illiterate to figure it out myself. Can anyone explain how to do? We definitely have ruby-throated hummers, but no adult males. Two females and one that appears to be a juvenile male, since he has a patch of darker coloring on his throat, but it isn't red. We got another feeder to put close to the garden, and hung the original (single tube) one off a plant hanger attached to the house, so it hangs right in front of the family room window. My cats sit there and go CRAZY over the hummers, but they just hover for a moment until they realize the cats can't get to them, and then go about their feeding. If we are in the yard, they dive bomb us, too, as if to say, "Hey, whose yard is this anyway?!" They seem fearless. We love them! We only have the ruby throated hummers here in Missouri. The females are dark colored in green or greenish brown and the males have a bright red throat. I'd bet you have some males around somewhere, but just haven't spotted them yet. They are feisty little guys and like to dive bomb each other at the feeders and are so much fun to watch. We never get tired of them. Here's a link to an interesting story. There are more links contained within the article. Nope, have never seen any with bright red throats, so I guess the three we have seen are all females. (I thought I read somewhere that young males look more like females, but maybe I'm confusing my species!) We are just happy to have three who seem quite content to return to our feeders over and over again each day. Hopefully they will remember us and will return next year, too. Would love to post my photos of them, but so far have yet to figure out how to do so. I followed your instructions for using photobucket, but when I hit "preview" after posting my reply with the photobucket code, I don't see the pix. Should I be able to see them in the preview? I live for the time of the year when the hummers and hummermoths come back to our yard.....anything that brings a smile to my wife's face makes me happy. St. Louis gardener wrote: I followed your instructions for using photobucket, but when I hit "preview" after posting my reply with the photobucket code, I don't see the pix. Should I be able to see them in the preview? Sorry, I meant to respond after this, but I was distracted, then I dropped the ball. Yes, you should be able to see the photo in preview. Try it anyway, and let me see what you've done. If the photo doesn't show, I'll either fix it for you or show you how to fix it. I get to see them every morning. I too get up very early, to water the garden. Those things are incredible! Always in the garden, making their rounds in the morning. Mid afternoon - in the front of the house, scouting the row of Double Knockout we have. Terrific birds indeed! 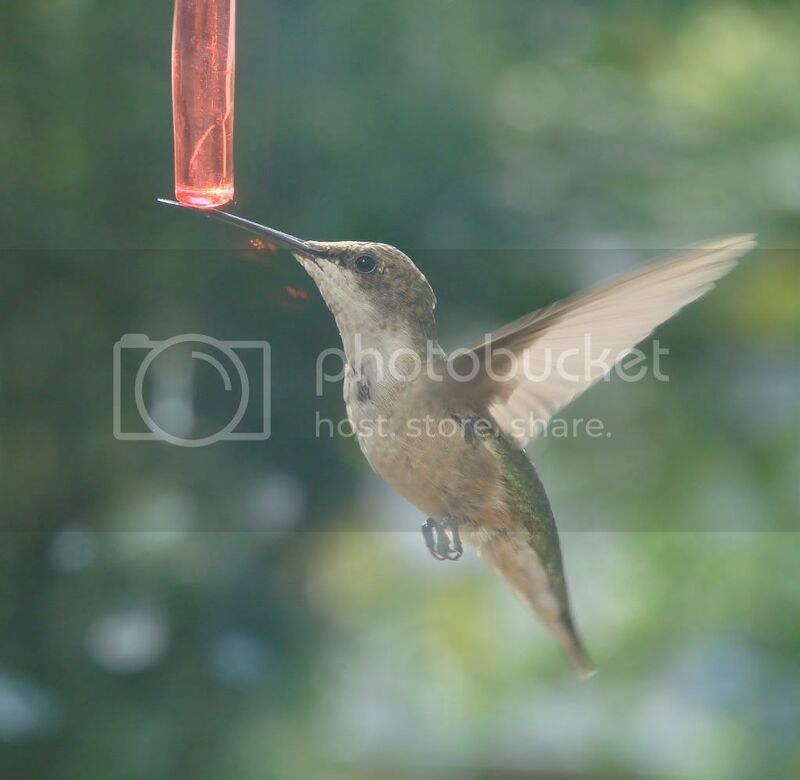 I put up a hummingbird feeder right outside the window next to the kitchen table last summer. It has been hanging there untouched for a year. And suddenly a few weeks ago, the level started dropping down a bit. It was empty last night so I refilled it. OK, so it took me a year to figure out how to post pix, but here they are. Our hummingbirds have returned, and they are hungrier than ever.